Growing up, my little brother flushed a golf ball down the toilet. My dad had to take the whole toilet out and try to lodge the golf ball out. In the end, we had no toilet because it cracked in half trying to get it out. Glad we had a second bathroom! My little brother flushed many things. The house I grew up in is a large 3 family house. 2 of the apartments downstairs are rentals and we lived upstairs. When my dad managed it, he had the 2 tenants apartments converted to forced hot water heating systems, yet he never got around to converting the upstairs apartment. After my dad passed away, I was left with the job of managing this property. The boiler was brand new, as the old one failed several years ago in the middle of a New England winter, so it had to be replaced. However, the pipes were still leaking and had been patched one too many times. The boiler may have been brand new, but everything that the boiler connected to was outdated and leaked so much heat that not only did we heat our upstairs apartment, but we probably heated one of the tenants apartments downstairs. Plumber ProblemsSo, I contracted with a company to do the job. They just happen to be a 1-800-PLUMBING company and I knew they do great work from past experience. 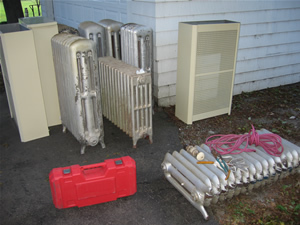 The first day of work consisted of removing 7 cast iron radiators from the upstairs and hauling them out of the house. Believe me, that was a full days work and then some. Those radiators are very heavy. The job went fairly smooth and I actually took my mom on a little trip to Cape Cod for a few days so the plumbers could get the job done. Of course in a house that is over 100 years old, all kinds of surprises come up. So I don’t drag this story out too long, I will just comment that it did take them a bit longer than scheduled, but if you want the job done right, something like this you cannot rush. Also, it is a difficult job changing a single thermostat (1 zone radiator system) to a 5 zone forced hot water with auxiliary hot water tank that is connected to the boiler. Running a lot of Pex tubing, thermostat wires, valves, controls, etc. I am quite impressed with how the whole thing looks in the cellar. The job took a bit longer and I actually had to re-schedule my flight a couple times. So its the last day about 6pm and when they connected the new thermostat to the old existing thermostat wire, it didn’t work. So now they are in the attic running a new thermostat wire. My mom is telling them they have been there long enough and that “they should go home” I guess when your in your late 80’s you have your limits. I just told her to let them finish the job. So there is a ladder in an outside hallway closet where the attic access is. And the plumbers left the door open…. curious aren’t they…. So, you know where that cat went? Of course, up the ladder and into the attic… So you know who went up after the cat? Yes, I did. So now I am crawling through what seemed like 100 feet of attic that is not meant to be walked in, to retrieve the cat. The cat seemed a bit frightened and I think she realized that she had gotten in a bit over her head. If she had climbed a tree, I would have called the fire department, but I decided that I could get her out of the attic. Of course she was all the way at the very farthest end of the attic you could get to. So, watching my steps, I made it there, got the cat and carried her to safety inside the house. The new heating system has worked flawlessly for over 2 years now and I am sure the new tenants will like the convenience and cost effectiveness of having a 5 zone system! The kitchen faucet needed replacing in the house I grew up in. I called the plumber that my dad used to use and set up to have them replace it. Keep in mind the house is on the east coast, over 100 years old. The kitchen had been remodeled about 25 years ago, so I figure that faucet had to be at least that old. I am handy, but this was one job I didn’t want to tackle. Sometimes I know to leave well enough alone. Of course there are other times I get in over my head. The plumber arrives promptly and starts the job of removing the old kitchen faucet. All of a sudden I hear swearing and cussing and words coming out of his mouth that did not belong on any plumbing job where there are people living in the house the plumber is servicing. At the time, my mom who is in her late 80’s was sitting in the living room, well within range of the trash that is coming out of the plumber’s mouth. My mom is no prude and has been known to say a few choice words herself. After this continued for quite some time as the plumber struggled to get the faucet off, my mom decided to re-locate herself in another room and close the door so she didn’t have to experience any more of his colorful language. I asked the plumber how long he had been doing this and I think he told me around 12 years. I know sometimes faucets can be tough to remove, but this was getting ridiculous. In removing the faucet, he also managed to put some permanent dents in the areas where the sink is connected to any of the faucet parts. I was very surprised that someone with 12 years experience would have this much problem changing a kitchen faucet. It took him almost 2 hours to complete the job and I think it cost $450 including the faucet. That company will remain anonymous, but they no longer do any work in any house I need a plumber.